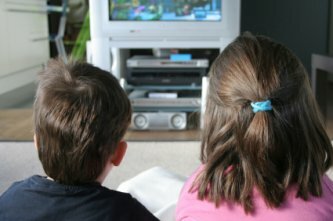 Home » Parenting » How Much TV IS Too Much? The American Academy of Pediatrics recommends NO television for children under age two and never more than one to two hours for older children. I find linking television viewing to other privileges works better than setting strict guidelines for how many hours a day to watch. At our house, you have to do your chores and homework, play outside, and read a book or do something creative before you can have “screen time,” whether TV, video games, or computer. This rule keeps the kids from mindlessly sitting in front of the TV for hours at a time. Just as you monitor your kids’ food intake to make sure they eat a reasonably healthy diet, so you need to monitor their media intake. Yes, this means that you need to sit down and watch what they are watching and decide if it’s appropriate. Do you have to watch every episode of every show? No, probably not. But my children don’t watch anything unless my husband or I have watched at least one or two episodes. And honestly, some kid shows are pretty good. I enjoy “Endurance” and “Avatar” as much as my kids and it gives us something to look forward to together. If we do find a show to be unacceptable, we explain why the kids can’t watch that show. Without guidelines, many kids will just sit down and watch whatever is on TV. When your kids ask if they can watch TV, ask them what is on. If they don’t know, they are probably just asking out of habit or boredom. Suggest some activities they can do or sit down and look at the TV schedule together. If there’s nothing good on, the TV should stay off. TV can provide fodder for many conversations. As you watch TV with your children, discuss what the characters are doing and why. Talk about which characters are nice and which aren’t. Talk about whether the things people are doing and saying are realistic and whether they match your values. You don’t have to be preachy, just a simple comment like, “Wow, she’s not treating her friends very nice” can show your children that what they are seeing is not acceptable behavior. Remember to discuss advertisements as well, explaining to your children that the stuff they see on TV is probably not nearly as cool in real life. TV does not have to take over your child’s life! Set appropriate limits and boundaries, just as do with other areas of life. Stacey Schifferdecker is the happy but harried mother of three school-aged children—two boys and a girl. She is also a freelance writer, a Children’s Minister, a PTA volunteer, and a Scout leader. Stacey has a Bachelor’s degree in Communications and French and a Master’s degree in English. She has written extensively about parenting and education as well as business, technology, travel, and hobbies and writes frequent articles for More4kids.